It seems like just about every prominent fairy tale was at least briefly considered to be the follow-up to Snow White and the Seven Dwarfs, even before it was clear that the Disney Studios would survive that film's anticipated box office failure. Of course, when Snow White instead proved to be one of the great hits of its age, a second Disney animated feature went from being a pipe dream to a dead certain necessity, and as it turned out, their second work would not be adapted from a fairy tale at all, but from an Italian children's novel published in the 1890s, Carlo Collodi's Le avventure di Pinocchio. It is said that the studio passed on by such tales as The Little Mermaid and Sleeping Beauty because the story men couldn't figure out what to do with them, which makes no sense given what Collodi's book gave them to work with: it's bizarrely European and incredibly nightmarish. But glad we all are that they figured out how to whip this surreal story of an animate puppet careening through one grotesque scenario after another into something much friendly and more straightforward (and I'm going to assume, as I did with Snow White, that I don't actually have to enlighten you as to the details of that story), for their Pinocchio is one of the crown jewels of American cinema, and arguably (at least, it's the argument I'd make) the most beautiful animated movie in history. It's telling, I think, that the two most visually rich Disney features ever made both came out in 1940; it implies to me that however proud Walt was of what he and his animators had achieved with Snow White, he had concerns that the medium wasn't being taken as seriously as other visual art forms. Clearly, I cannot prove such a thing, but it remains the case that every time I watch Pinocchio, I am always struck as though for the first time by how obviously painted it is. Part of this is due to the change made from watercolor backgrounds, used in Snow White, to gouache and oil paintings (this would be the technology used on all subsequent hand-drawn Disney features, save one). The result is less soft and warm, but provides for a greater range of representation, one exploited her to the fullest. In this film more than any other, the backgrounds contradict themselves between the illusion of depth, augmented by unquestionably the most sophisticated and lovely multiplane camera work in any Disney film, and the reality of flatness. Unlike any of the studio's other films, the backgrounds in Pinocchio reveal the texture of the paper they've been painted on, making the physical fact of the art important in a way that it rarely or never is elsewhere. Even in the character animation, brushstrokes are plainly visible in a way that is usually avoided with great care. It's seen everywhere there are soft feathering effects: most easily noted on the tufts of hair on either side of the cat Figaro's whiskers, but also on the Blue Fairy's wings and hair, and on the feather atop Pinocchio's hat. Unlike any other Disney feature, save perhaps for some of the sequences in the same year's Fantasia or a handful of the Silly Symphonies, Pinocchio feels like a moving painting, and a particularly rich painting at that. At times, the movie almost feels like it's just showing off what technically perfect animation looks like; particularly in the Monstro chase at the end, when the whale, a collage of hashed lines that almost looks like a pencil drawing, plows through the finest water ever animated, by hand or by computer; eerily realistic movement and splashes, but the appearance of the liquid itself (it's "skin" if you will) is rather more impressionistic. Water like that could only ever exist in animation, and thank God that it does, because it is one of the most beautiful things in cinema. There is also the character design, none of it especially realistic in the manner of Snow White, Prince Charming, or the Queen (except the Blue Fairy; and she is painted in such an experimental way as to leave realism far behind), but none of it necessarily cartoony at all. What has always impressed me most about the characters in Pinocchio, visually speaking, is their relative mass: Figaro is clearly a little bundle of fluff, Pinocchio himself is obviously much lighter than a human boy of the same size, the magnificently animated villain Stromboli is one of the most fleshy characters in any Disney film. And so forth. A great deal of attention and time went into the design and animation - the occasional stiffness and jerkiness present in Snow White is gone almost completely (there is only one moment in the whole of Pinocchio where I detect a flaw in the animation: it's when Jiminy Cricket falls into the hole in the pool table), replaced by the most fluid, accurate character movement in any hand-drawn animated film I can name. For all its technical accomplishment and breathtaking beauty, it is nonetheless a fact that Pinocchio lost a great deal of money on its first release, and it took many years for it to achieve the classic stature given to many of Disney's films automatically; and though I don't personally understand why, I have some suspicions. For one thing, the plot of the film is unusually episodic, never a particularly good way to tell a story with any kind of graceful flow. It's also ungodly terrifying, almost capricious in its cruelty: for the sin of being innocent and trusting, Pinocchio is thrown in a cage, threatened with a huge axe, and turned into a donkey - hell, we don't even have to go so far as the plot, just the design of Pleasure Island is terrifying to look at. It's a dark film by Disney's standards, all around, and I imagine that this has done no good to its reputation with audiences. But the counter-argument to that is Pinocchio's essential sweetness: it's there in the good characters, ranging from Pinocchio himself (one of the most guileless and appealing of all Disney heroes), to the impossible cute Figaro, and especially to Jiminy Cricket, who anchors the film and is, I think, the primary reason that Pinocchio remains much less otherworldly than many of Disney's "storybook" movies, not only because of his modernism, but because he constantly pulls the audience into the storytelling, erasing the "once upon a time" distancing effect - though it takes place in a European never-where, it also feels more immediate than any of the princess stories. The film also boasts one of the best musical soundtracks in Disney's history: not least among the songs being "When You Wish Upon a Star", which has of course become an anthem of the Walt Disney Company itself in the years since the film's release. For that reason alone, it seems odd that the film had such a chilly reception for a large chunk of its history; many a film was advertised based on the success of its songs, and very often those songs were nowhere near as good as Leigh Harline and Ned Washington's five brilliant little compositions. But we know better these days, right? 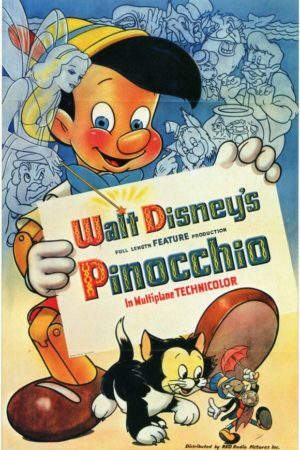 Pinocchio has become enshrined at the top of virtually every ranking of great animated films, great films of the 1940s, et cetera, helped out no doubt by Disney's frightening ability to drum up interest for any and all of their products by the judicious application of marketing. But marketing can't conjure up artistry from thin air, and I think that has more to do with the film's eventual rescue than anything: beauty will out, and Pinocchio is as beautiful as any color film has any right to be. The fact that it's a genuinely touching coming-of-age story and playful musical comedy-adventure besides that is really just the cherry on top.